In 1987, Pro-ma Fuel and Oil Additives introduced the Pro-Ma MBL Lithium Complex Grease in Australia and New Zealand. Greases plays a very important part in the lubrication of vehicles, machinery, and equipment, and are much different from oil. While oil is normally circulated rapidly throughout the specific mechanism, greases usually remain in a particular area, and is retained there by the shape of the housing, seals, or by its natural tenacity. Greases are usually manufactured from an engine oil base which has been mixed with appropriate modifiers, thickeners and other additives. As with engine oils, the viscosity of particular greases needs to be correct for the ambient temperature, and the specific temperature range under which the component will operate. it has nylon cage compatibility. Think of Pro-Ma MBL Lithium Complex Grease as a sponge containing the lubricating oil, and when pressure is applied, some of the oil is released to provide lubrication. exceeding the continuous operating temperature of the grease. Pro-ma Fuel and Oil Additives would like to offer advice on how to use their Pro-Ma MBL Lithium Complex Grease in order to avoid these problems and get the most benefit and highest performance possible from their product. If different base greases are mixed, the result can be a thickening of the grease, or a breakdown of the grease sponge, releasing the oil. 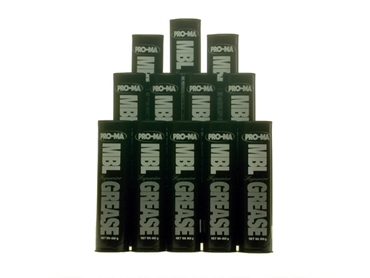 Pro-Ma MBL Lithium Complex Grease is compatible with Lithium and Synthetic greases. It is partly compatible with aluminum complex greases. It is not compatible with: calcium, bentonite or clay, barium and sodium grease. If greases are not compatible, all bearing must be free of oil lubricant. If partly compatible, cleaning is recommended. For example, if use of the Pro-Ma MBL Lithium Complex Grease in a car’s disc brake wheel bearing is desired, it is important to wash the bearings, the hub and the spindle before applying the Pro-Ma MBL Lithium Complex Grease as many manufacturers and service facilities use a clay or bentonite grease to withstand the high operating temperatures encountered with disc brakes. Re-pack only the bearings, not the hub or the dust cap. There may be some exceptions to this, so follow the manufacturers’ instructions. Do not add Pro-Ma MBL Lithium Complex Grease to a sealed bearing as it is difficult to know the original type of grease used, and it is possible to over fill the bearing. Over greasing is a major source of bearing failure, particularly in high speed application. If a bearing is packed with grease and operated at high speed, the resultant heat can cause the grease to break down. Consider an alternator bearing on a car. The quantity of grease put in at manufacture is hardly noticeable, however it is sufficient to last the alternator up to 150,000km, in most cases. The same bearing fully packed will not last nearly this long. It is important when greasing ball joint and universal joints not to burst the seals, otherwise dust and water can enter the joint resulting in early failure. Grease all joints if possible, with the load off the joint. Then rotate the joint so that the grease can get between the areas under pressure. Otherwise the grease can by-pass the areas that need to be greased. Grease oozing from the joint does not necessarily indicate that it has reached the working surfaces. Remove all excess grease as only the grease within the joint can do any lubrication and excess can attract dust and become abrasive. Pro-Ma MBL Lithium Complex Grease should be used sparingly as it will normally last many times conventional greases, thus offering a cost-effective greasing solution. The dropping point (the temperature at which the oil will drop out of the grease) of Pro-Ma MBL Lithium Complex Grease is 280+°C. This does not mean the grease will function continuously at 270°C however, the maximum continuous operating temperature is 205°C.